Summer fun activities like Hoop-It-Up Volleyball are great because they allow kids to be active but within a controlled environment where different ages and abilities can all participate. 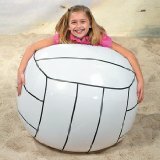 Hoop-It-Up Volleyball is a great kids game because it doesn't require a lot of skill to play. It's just one of many fun ideas for summer kids activities. The game simply involves hitting a beach ball towards a goal and keeping another team from doing the same. Attach 1 hula-hoop at each end of the playing area about 2 feet off the floor. You can attach them to the wall with masking tape or just lean them against the wall. Half of the players on each team are designated as either offensive or defensive players, and they are assigned to one side of the court. Player must stay on their designated sides; they cannot cross over to the other side. The object of the game is to score points by throwing or hitting the beach ball into the hoop. The leader tosses the ball into center court to begin the game. Each team tries to advance the ball up the court by either hitting it or throwing it. Players cannot move with the ball. If they choose to catch it and throw it they must catch and throw from the same spot. Players can move around in their half of the court to chase the ball and hit it, but if they catch it they must freeze in that spot to throw or hit it. Once a goal is scored the ball is given to the other team. They toss it in from the end line by the hoop and try to advance the ball to the other end to score. A player can only hit or throw the ball one time before another player has to touch the ball. If a player hits the ball out of bounds, the closest player from the other team hits the ball back in bounds. One point is scored each time the ball goes through the hoop. The first team to reach a predetermined number of points is the winner or the team with the most points after a certain period of time. For younger players: Don’t use the 1-hit rule. Allow players to hit the ball as many times as possible. Use a small court and assign them to stay in a spot. For fewer players: Use a small court. Allow all of the players to roam the entire court. The 1-hit rule should keep players from dominating the game. Have the defensive and offensive players swap sides after a certain amount of time. Have more than one ball going at once. If there is limited space, have players sit in designated spots. They are only allowed to get on their knees, but they have to stay in one spot. 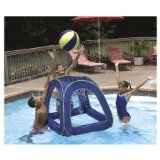 Use a jumbo-size inflatable basketball goal. Instead of using it in the pool, set it up on the lawn and hit or toss the ball into the goal. For more fun kids sports activities and summer fun activities, check out our complete list of free kids games. Just click on the game you're interested in to find some quick directions, tips, and modifications that will help you serve up some fun games in no time! Many of the activities that require a larger number of players can be modified for smaller groups.